" It is very rare to find homes in Arizona that use wood shakes or composite asphalt shingles." Homes in the southwest typically adhere to a consistent style, using similar home and roof materials for all homes. Arizona is well known for having the traditional adobe or stucco wall homes with a clay tile roof. Generally, the style and appearance of homes does not vary much and it is rare to find certain roof materials in states like Arizona. Due to the hot climate and minimal rainfall, roofs in Arizona stick with clay tile or copper roofs. 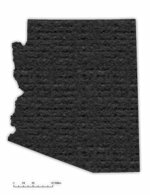 It is very rare to find homes in Arizona that use wood shakes or composite asphalt shingles. The main reason wood and asphalt shingles are not used in this type of climate is durability. The high heat can cause wood shakes to bend or crack, leaving the underlay materials vulnerable to the elements. Asphalt shingles are made from a composite material that can give off toxic chemicals, especially in high heat. Most homes in Arizona follow the traditional style of the southwest, namely, earth tones and earth based materials. Homes follow a color palate using browns, tans, gold and cream colors. The use of a lighter colored wall with darker accent colors on windows and the trim allows for the homes to reflect sunlight, keeping the home cool in hot summer months.